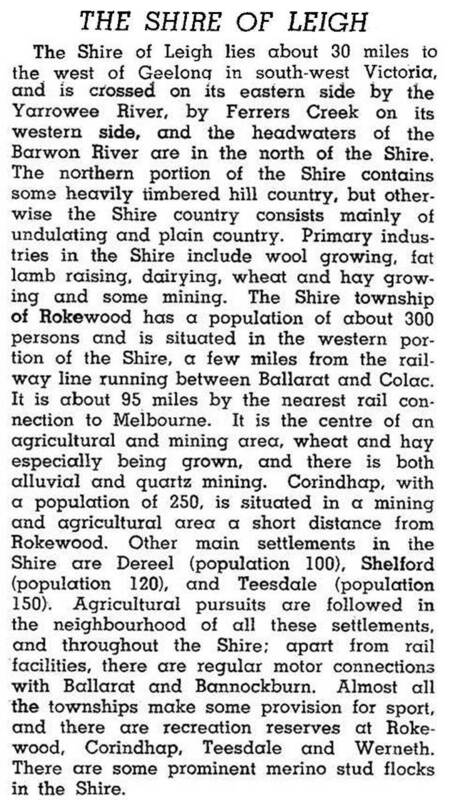 Leigh shire (1861-1994) was an area principally of undulating plains apart from timbered ranges at its north-western corner around Rokewood. Its western boundary was the Woady Yaloak Creek, its eastern boundary in the vicinity of Shelford and Inverleigh and its southern boundary was an irregular line in the vicinity of the Hamilton Highway. The shire was named after the Leigh River, but how the river’s name came about is apparently unrecorded. Several large pastoral runs occupied the shire, one of them being Golf Hill, taken up by George Russell for the Clyde Company in 1839. Russell instigated the area’s first village where a road crossed the Leigh River. It became Shelford, which was the main centre until Rokewood’s gold mining overshadowed it. Shelford Road District (1861) was succeeded by the shire on 22 March 1864. Rokewood secured the shire offices and the hall was built midway between there and Shelford, at Warrambine Creek. Rail services comprised a line southwards through Rokewood (1911-53) and a line parallel to the Hamilton Highway (continuing). Soldier settlement farms fell in numbers after failing wool prices during the 1960s. In 1994 farming occupied 97% of the shire’s area of 982 sq km. The predominantly grazing properties carried 428,000 sheep and lambs and 13,800 meat cattle. By the early 1990s the shire’s main urban or rural/residential population was in Teesdale. On 6 May 1994, Leigh shire was united with Bannockburn shire and parts of Buninyong and Grenville shires to form Golden Plains shire.